The Turkish government must cease illegal military operations that have killed hundreds of innocent Kurdish civilians, an activist group leader told Sputnik during a protest at the Turkish embassy in Washington. "It's a lawless war, it’s a criminal war. Civilian Kurds have been subjected to [Turkish] tank attacks, helicopter attacks… hundreds of civilians have been killed [including] women and children," American Kurdish Information Network Director (AKIN) Kani Xulam told Sputnik on Friday. "We want this war to come to an end." On Friday, AKIN launched a vigil across the street from the Turkish embassy in the United States to protest Ankara's violence against civilian Kurds. The Kurdish activists plan to hold a vigil every day for roughly four months – or until Turkey responds to their demands. Tensions in Turkey escalated in July 2015 after 33 Kurdish activists were killed in a suicide blast in Suruc near the Syrian border. Two Turkish policemen were later murdered by the Kurdistan Workers' Party (PKK), an action which, in part, led to Ankara's military campaign against the group. 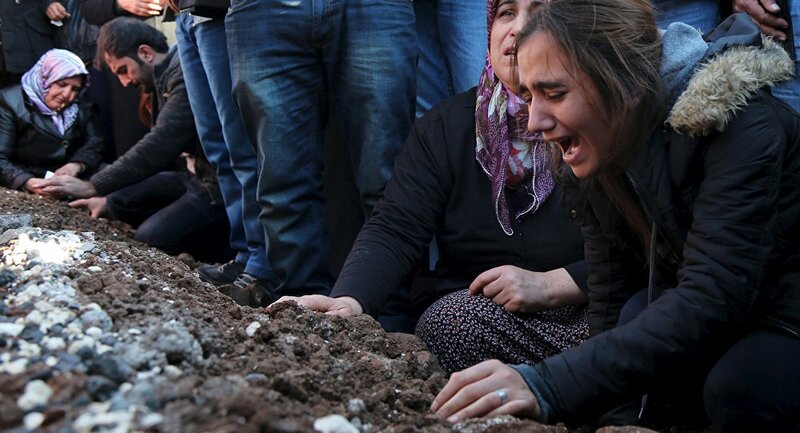 Human rights groups in Turkey have put the civilian death toll since July at well over 100. The US government, Xulam argued, needs to break its silence and condemn Ankara for what he called war crimes against the Kurds. "The White House needs to find its voice to condemn these attacks, to condemn this war," Xulam claimed. AKIN intends to maintain a presence across the street from the Turkish embassy on a daily basis for months, and Xulam hope this longevity will "provide a spark," to a larger scale protest to protect Kurdish rights against Turkey's illegal war. On Friday, Turkish security forces killed 19 PKK fighters in the country's southeastern Sirnak and Diyarbakir provinces, according to Turkey's General Staff. Turkish President Recep Tayyip Erdogan said in his New Year’s statement that Turkish security forces had killed 3,100 PKK militants in 2015. In July, the same month Turkey opened a new front in its conflict with Kurdish rebels, it simultaneously vowed to strike Daesh. Turkish officials have claimed that both campaigns are part of the same fight against terrorism.